Web design landscaping companies | Sites for landscaping, landscapers, hardscaping business. Branded website design and SEO services for TOP 10 placement in search engines. VISIONEFX, the #1 choice for small business professionals looking for the BEST website marketing solutions. No plug-in-play, no inexpensive web site templates. Every website we create reflects the look, feel, style and branding of your business. This recent web design chesapeake project for Pepper & Co. provides a branded website presence in a highly competitive space. VISIONEFX, a professional Web design company provides exceptional web design for small and large businesses throughout the United States to include; Web applications, E-commerce web design, Word Press web design, Joomla web development, SEO and web maintenance services. Call: (757) 619-6456 or email info@visionefx.net. We also invite you to read our client reviews. Feel free to reach our and contact our website customers. They will tell you our web site design and lightning fast web site maintenance services are second to none. 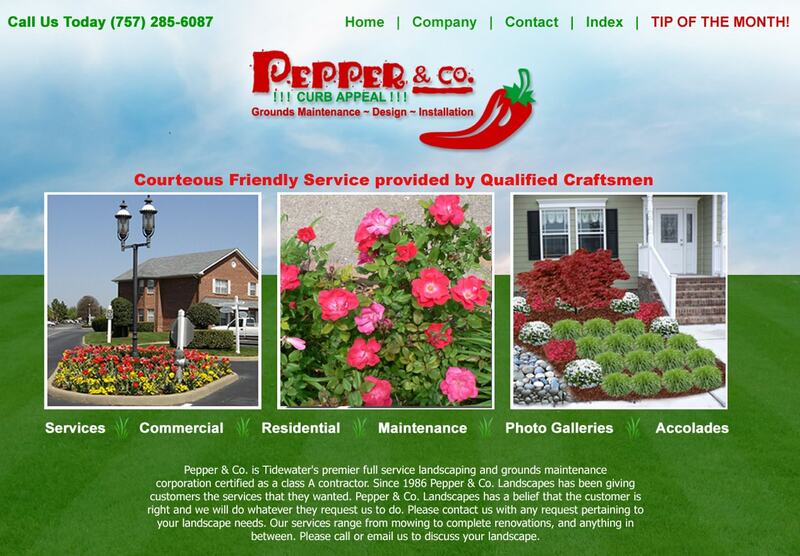 When it comes to ‘Web design landscaping companies’ – nobody does it better.